In this article, we're going to cover the frequently asked "should I polish or wax my car?" and to answer that question you first need to know what ​the difference is between a car polish and a car wax. What is a car polish? So, which one goes first? Here we're going to talk about polishes that can PERMANENTLY restore the paint of your vehicle. There are various other types of 'polishes' available such as glazes which contain oils and silicones that are used to help MASK certain paint defects and there are All-in-one (AIO) type polishes that contain very fine abrasives, oils and silicones to mask defects and some form of sealant to protect the paintwork, but for the sake of the article we're going to stay with what I call a 'true' polish, one that does nothing more than help fix any defects. (We will delve in to glazes and AIO polishes in a future article) A car polish (sometimes referred to as a compound) is used to CORRECT the car's paintwork, usually a cream type liquid that contains micro-abrasives that are used to abrade a very fine layer of the clear coat (lacquer), or top coat of paint on older vehicles, to help in the removal of fine marring, scratches and fading of the paint due to oxidisation. There are a plethora of polishes available from the majority of detailing brands such as Meguiars, Menzerna and Scholl Concepts, each having different levels of 'cut' and finish. The polish you will need depends on the severity of the defects you are wishing to remove and the way in which you are applying them, by hand is not as efficient as using a machine polisher, but by hand requires next to no experience whereas using a rotary polisher or dual action polisher takes some experience as the fast cutting action provided can cause damage to the paint when used incorrectly. If you do fancy trying your hand at machine polishing then there are some excellent tutorials on YouTube, Junkman2000 for example, has an excellent instructional series on polishing with a Dual Action machine. A wax is a LSP, or last stage product, and is used to help PROTECT the car's paint finish (There ARE also different types of LSP available, and as with glazes and AIO polishes, we will cover those in a future article). You can read more about how car wax works on this article. As with a polish, there are various different types available, natural waxes, synthetic waxes and a hybrid of both natural and synthetic. Natural waxes contain waxes such as bees wax, montan wax and the famous and almighty carnauba wax, whereas synthetic waxes contain man made polymers. As with polishes, there ARE an abundance of waxes available with nearly every detailing brand offering a wax in its line up. The wax is applied to the paint, usually as thin and uniform as possible, and allowed to cure for an amount of time (the time it takes varies wax to wax and also with different atmospheric conditions) and then buffed off. Once buffed off the wax leaves a protective coating behind, protecting the paint from the dirt, grime and industrial fallout it is subjected to when on the road. It also makes the cars paint more hydrophobic, meaning that any water, and dirt contained in said water, IS less likely to bond to the paint than if the paintwork was left unprotected, thus making the vehicle easier to clean and less likely to suffer damage such as bird lime etchings. So, the answer to the question "should I polish or wax my car?" is, both, you polish first, IF the car needs it. If you're happy with the condition of your vehicle's paintwork and don't feel the need to polish, then it is straight onto protecting the finish with a wax. It's also good to remember that clear coats and top coats of paint aren't infinite and polishing abrades them. If you're out there every other day polishing you will eventually cut through the top layer, something only a re-spray can repair. 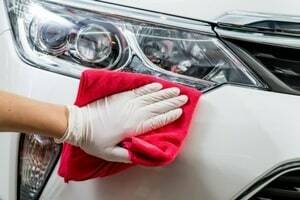 ​Car Polish and Wax: Are They the Same? 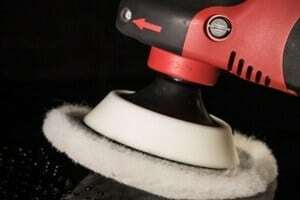 ​Car wax is used after washing and polishing to add a layer of shine to the car as well as a layer of protection. It is a type of paint sealant. If you remember the little rhyme "polish to perfect, wax to protect" you won't go far wrong in the future. 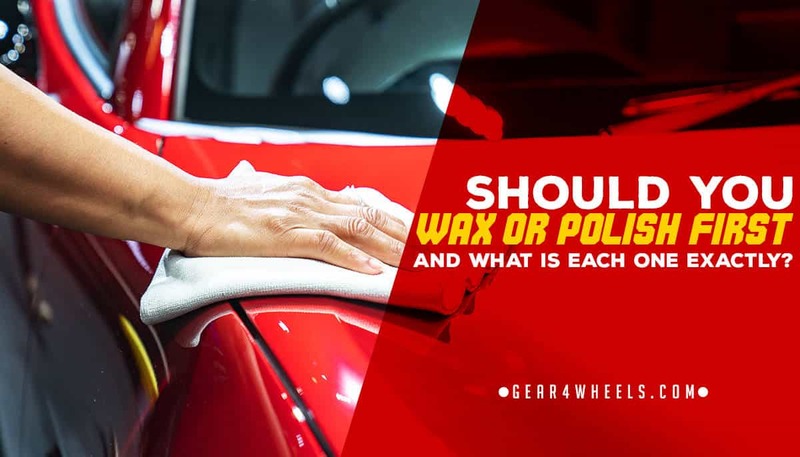 Hopefully this article serves you well to understand the difference between wax or polish and how to utilise them as required. Should You Wax or Polish First? And What Is Each One Exactly?